CHS/MST Class of 2014 Grad Riley Hein Speaks! CHS/MST Class of 2013 Grad Abbie Younkin Speaks! Friends, Papermakers, Magnetos, lend me your ears! 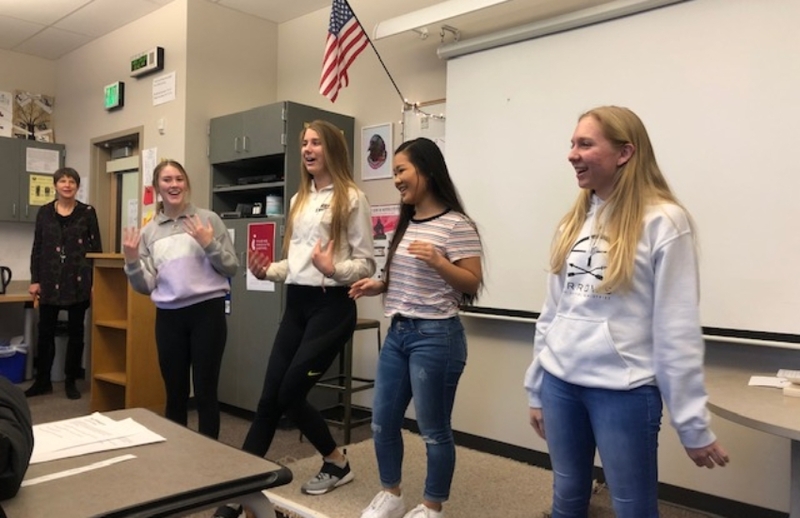 The CHS MST Magnet program will travel to Ashland, Oregon next September, 2019, to attend performances of Alice in Wonderland and Hairspray as well as participate in a workshop. We will miss all of Friday 09/20/19, leaving about 9:00 AM that day, TDB and finalized in the fall. As usual, we’ll stay at the Ashland Commons Youth Hostel and take over the entire establishment, with the guys in one area, the gals in another. We should be back to CHS by about 11 PM on Saturday night, 09/21. How much fun is this trip? 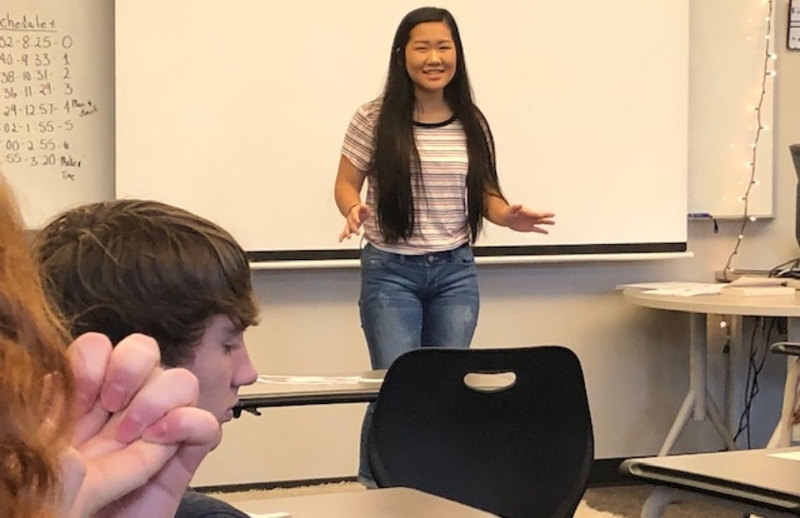 In our exit interviews with graduating Magnet students, this experience is often cited as one of their favorite Magnet memories. So don’t miss out on this every other year opportunity to build community with us and see professional live theater in a spectacular setting. After you’ve paid for and secured a spot, please download the Ashland Perm Slip and return it to Mr. Greene in room 710 at CHS or via email. P.S. This trip usually sells out very quickly. If you miss out on getting a spot and would like your name added to our wait list, please email Mr. Greene to let him know ASAP. He will create a list of students (based on the order in which they notified him) who will be contacted in the fall if someone is unable to go on the trip. 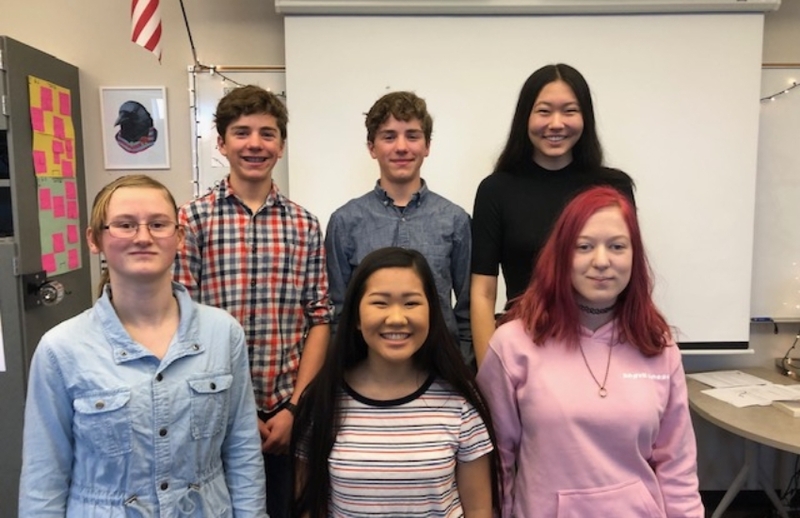 Camas High School MST students and others competed in the Southwest Washington Science and Engineering Fair this past weekend at Skyview High School in Vancouver, WA. They did very well! We’re still finalizing the details and exact titles of the awards, but here’s what we have so far (we will update as needed with corrections …). Rahul Ram (individual) and the team of Gareth Starratt and Julian McOmie (LiDAR) won Best in Fair and were awarded all-expense paid trips to the International SEF in Phoenix, AZ., May 12-17. Ram won first in Microbiology (the students thought), and Gareth and Julian won first in Robotics and Intelligent Machines. Andrew Kim won first in Environmental Engineering and Best in Category for his project looking at using mussels to filter out pharmaceuticals from marine environments. He will be competing at the state SEF at the end of this month. Alexis Williams, Amy Rude, and Megana Kommareddy won second in Environmental Engineering, a sustainability award, and the Women in STEM award. They will be competing at state as well. Jaden Le, Alex Gee, and Joey Stanley won third in Environmental Engineering and the Renewable Systems award. They will also be competing at state. Michael Lee, Ben Saunders, and Tyler Stanley won first in Engineering Mechanics, Best in Category, and were finalists for Best in Fair. They will be competing at state. Monica Chang won first in Biochemistry and the Naval Service Award. Tyler Gee won first in Systems Software, and a Navy award and Intel award in computer science (but he wasn’t sure about those titles). Picture 1: Gareth Starratt, left, and Julian McOmie, right, of Camas High School, experimented with making a cheaper LIDAR scanner, the technology used in surveying equipment and self-driving cars. Photos by Steve Dipaola for The Columbian / Picture 2: Rahul Ram, right, of Camas High School, winner of last year’s SW Washington Science and Engineering Fair, explains this year’s project to judge September Nelson on Saturday at Skyview High School. CHS/MST junior and published author Mackenzie Snell emailed and asked for our help in spreading the word about a volunteering opportunity that would help benefit the nonprofit Micah’s Miles. See below for her message and an opportunity to sign up for this if you’d like. “Micah’s Miles has teamed up with Why Racing (a running club in Vancouver)! They have offered for Micah’s Miles nonprofit to be the beneficiary of the Kids Race event on Friday, Aug. 16, 2019 IF we can fill 40 volunteer spot just for Friday night. I am reaching out to everyone we know to see if you might be interested in volunteering to help a great cause! It should be a lot of FUN! Here is the link if you are willing and able to volunteer. You are welcome to sign your spouse up and any friends that want to come with…We HAVE to have 40 volunteers in order to be the beneficiary of this event! When/if you do sign up, it will ask you if you are volunteering for a non profit, say YES and then write in Micah’s Miles. We’ve made the decision to pre-emptively cancel our scheduled night of service for 2/12/19. With less than 20 of us able to attend, that seems to make sense, especially with still sloppy roads and the threat of more incoming weather. I did reach out to CCFB to ask about options for another date this spring. They offered up June 11th as a replacement date, so I told them we would take that day. Mark your calendars for that date, please! We’ll regroup after the snow and insanity of winter is gone and give it another shot. Thanks as always for your willingness to serve! December and January are great months for reflection as we close one year and start another. For me, that’s often sparked by visits from former students. I’ll be sharing some of those updates here on this page, asking them to share what they’ve been up to, the lessons they’ve learned and applied in their lives, etc. For this post, I’m sharing with you some insights from Riley Hein, CHS/MST class of 2014. The analytical thought process that the MST program aims to develop, as well as the opportunities to embrace the research process, will definitely help students in their lives after high school. It certainly translates well to studying a STEM discipline in college, but will be useful regardless of what students want to do after graduating (4 year college, 2 year college, trade school, military, mission, etc.). I would just tell them to remember the skills they have learned in high school (regardless of what they want to do) and do their best to apply them once graduating. And be humble, because it’s pretty incredible what the other people you meet will know or bring to the table skill-wise (again regardless of the career/school path you take). While at UW, I majored in bioengineering and was also a cadet in the Army ROTC program on campus. During my junior and senior years, I worked with several doctors in the Emergency Medicine Research Lab at Harborview Medical Center (downtown Seattle). The project I worked on sought to further understand the blood coagulation process, specifically with the respect to a drug that is commonly used for trauma patients experiencing massive hemorrhage. The efficacy of this drug, known as tranexamic acid (TXA), was previously identified to decline the later it was administered to patients in need. The cause for this decline in efficacy is still a mystery to doctors and scientists in this field, so my project specifically explored whether this trend was due to the concentration of several integral blood clotting proteins. 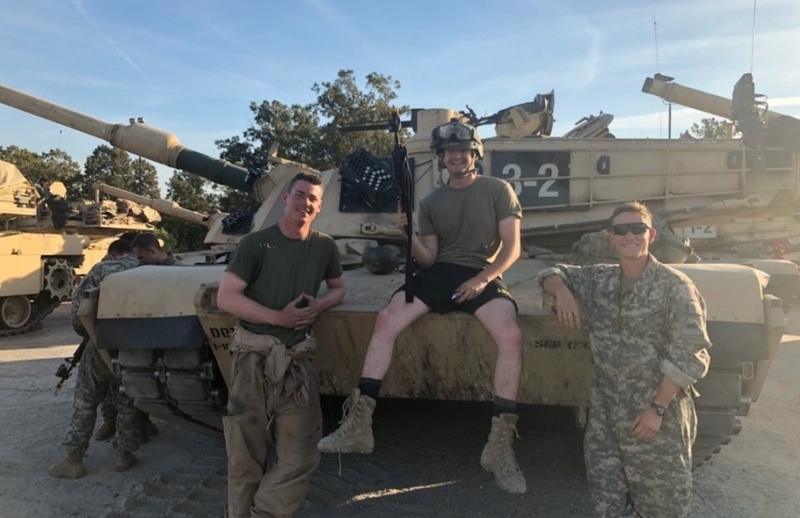 During my senior year, I also worked with several doctors from Madigan Army Medical Center to create a device for service members suffering from non-compressible truncal hemorrhage. Traditional tourniquets are effective for stopping blood loss from extremity hemorrhage, but the areas around the groin and abdomen pose a challenge due to their physical geometry. My team and I designed an “internal tourniquet”, which could be inserted near a site of injury in the abdomen and subsequently inflated (the device featured a balloon of sorts), thus applying pressure to the entire cavity. 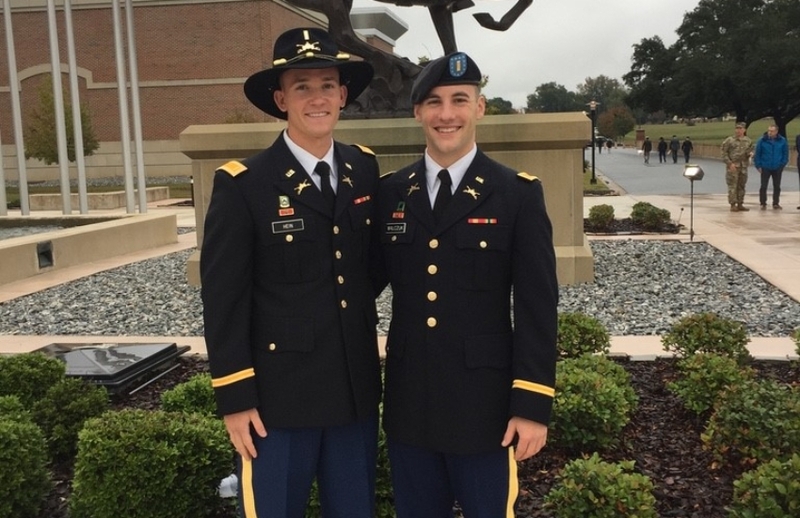 Upon graduation, I also commissioned as a Second Lieutenant in the US Army and moved to Fort Benning, GA to begin completing my basic officer training. After I complete my training here, I will move to Ft. Hood, TX for my next assignment. December and January are great months for reflection as we close one year and start another. For me, that’s often sparked by visits from former students. I’ll be sharing some of those updates here on this page, asking them to share what they’ve been up to, the lessons they’ve learned and applied in their lives, etc. For this post, I’m sharing with you some insights from Abbie Younkin, CHS/MST class of 2013. The list could go on but I have considered and researched almost all of these paths at some point in my life, so if you are at a crossroad or have questions, please feel free to reach out to me. I am currently working as a Patient Care Coordinator for Providence in Spokane, WA where I work with physicians and our clinical team to create treatment plans for chronic patients. This often ranges to diabetic education to cancer treatment options. I am also pursuing my Masters in Healthcare Administration while I finish up prerequisites for PA school. I have explored a lot of options and it is okay to not know exactly what/where you want to be! Just be wise and keep your options open to possibilities you may not have considered! I would also HIGHLY recommend medical mission trips or any mission work possible! Last summer I spent two months in Vietnam serving over 8,000 patients in rural communities. We set up a mobile clinic in a different site each day and provided optical care, medical consultation, physical therapy, medications, vaccinations, and public health services with physicians from the Seattle area. It was an absolutely humbling and amazing experience that completely affirmed my love for medicine and serving those who need it most. Please consider serving those even in your local community as it will give insight into suffering and humanity at its most pure. Please feel free to reach out to me with any thoughts or questions you may have and I would be happy to offer any advice possible! Magnetos, join us for a night of service on Tuesday, February 12th, from 5:15-7:30 PM, at the Clark County Food Bank. We need about 50 volunteers to work with teams of other Magnetos and staff to sort and/or repackage bulk donations for distribution to local families. For travel options and directions to the facility, click here. Please arrive 5-10 minutes before your shift. Check in at the front desk when you arrive. If you are arriving after hours, please ring the doorbell at the main entrance. The volunteer orientation begins promptly at the scheduled start time. If you arrive late, please check in with a Volunteer Shift Leader for directions. You will be turned away if you are wearing improper footwear as you will be working in the warehouse. Shoes must have closed toes and heels (no sandals, clogs, slippers or high heels). All new volunteers are required to complete a Volunteer Registration form. If you’ve previously volunteered here and have submitted a form, you’re fine. All volunteers are required to sign in and out on the Volunteer Service Log as a way to track volunteer hours. Parents and/or guardians are required to sign Volunteer Waiver forms for first-time volunteers under the age of 18 years. If you have cold symptoms or open wounds, please do not show up to volunteer. Temperatures in the volunteer areas can vary. Layers are recommended. 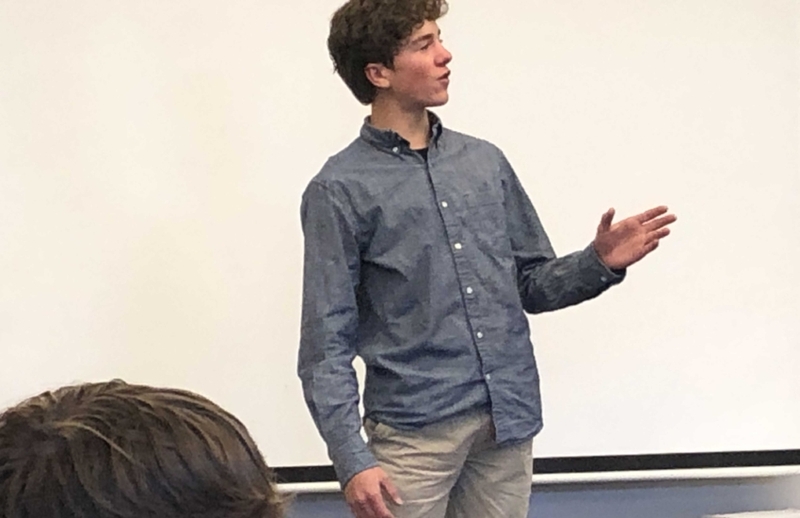 MST Sophomore Joey Stanley Wins POL! 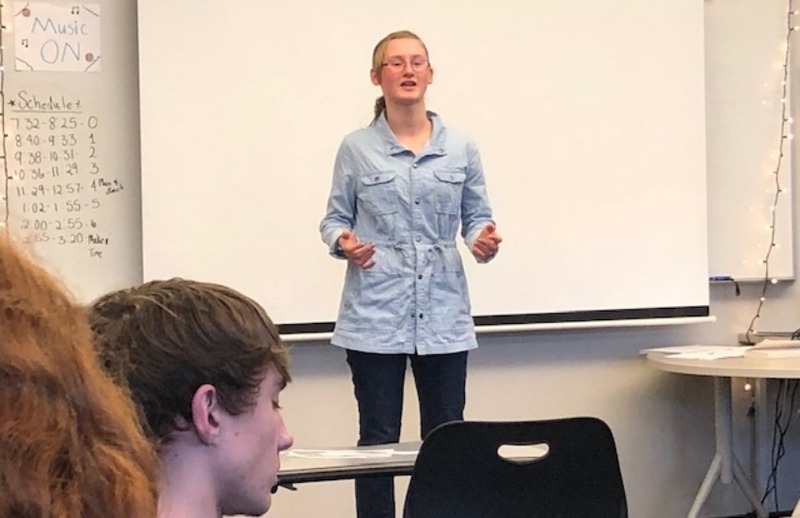 Performing in front of a packed house in CHS room 116 on January 23rd, Magnet sophomore Joey Stanley wowed the judges with his soulful interpretation of The Road Not Taken, by Robert Frost, winning the 2019 CHS Poetry Out Loud (POL) competition. 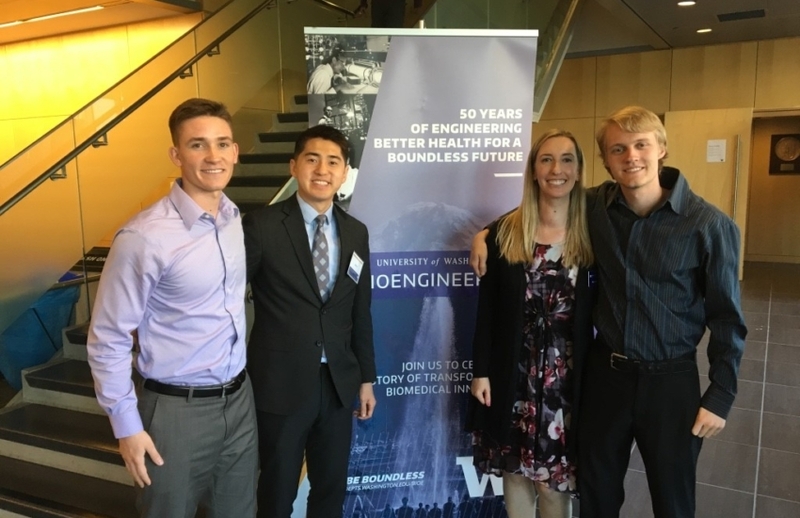 Congratulations, Joey, as well as to all the other contestants and the six school competition finalists, including two other MST sophomores, Tyler Stanley and Kate Staddon! Bravo! 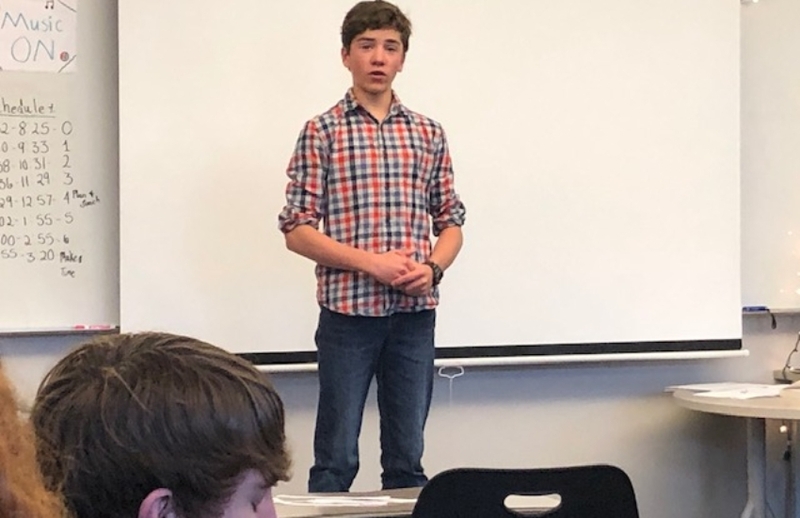 In order to advance to the school competition, he and the almost 30 other students first had to qualify in their respective English class competitions. 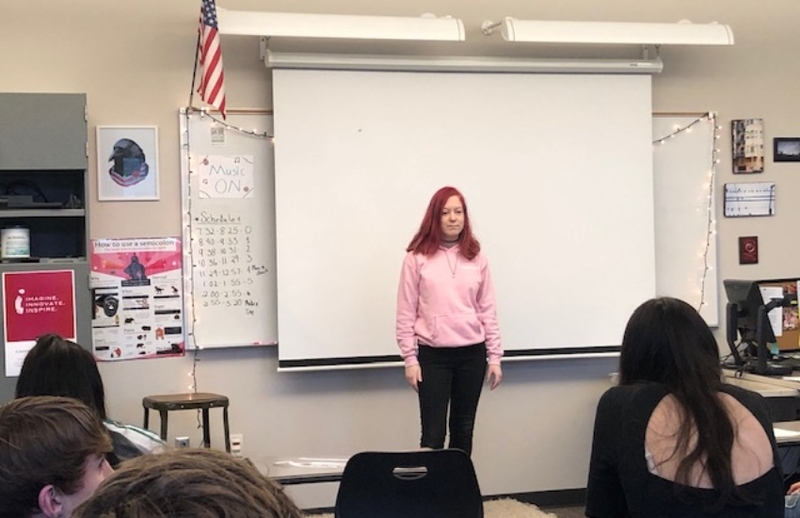 By virtue of winning the school competition, Mr. Stanley would have advanced to the regional competition, held last week on January 24th at the ESD 112 in Vancouver, WA., but since he was unable to attend the regional competition, this year’s runner up, Bailey Grubbs, had the honor of representing CHS at this event. Congrats, Bailey! And thank you for your awesome interpretation of Marge Piercy’s To have without holding. On a historical note, this marks the 12th anniversary of CHS involvement in this national recitation/interpretation contest. We estimate that approximately 475 CHS students have participated in the school competition, not to mention 2000+ students in the various classroom competitions held at CHS over the last 12 years. Long live the spoken word!